The big game is right around the corner, and that probably means many of you are creating a fantastic menu of gameday snacks. I know I did it one year, complete with themed desserts, complicated appetizers, and all that. But what if you're not in the mood to go all out, and you still want good food? 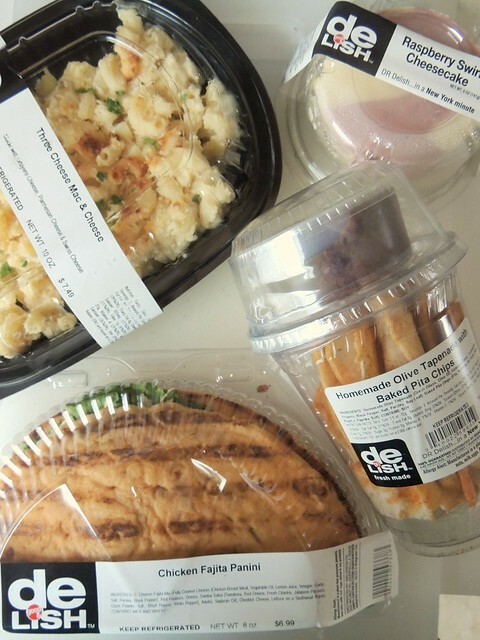 If you live in NYC, the answer is DeLish Fresh Food from Duane Reade. DeLish Fresh Food is prepared (you guessed it!) 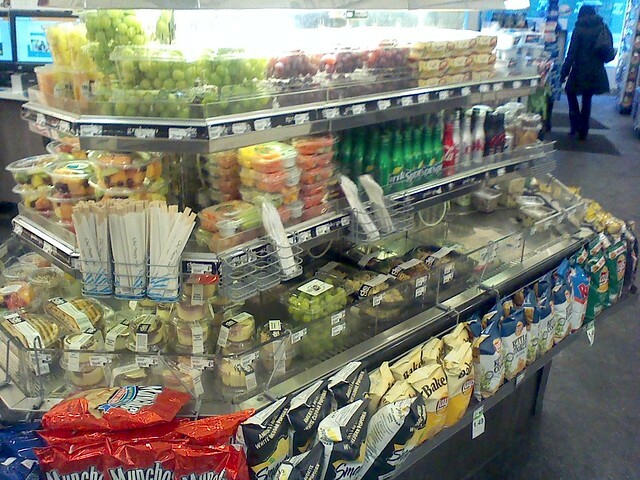 fresh and delivered daily to many Duane Reade stores throughout NYC. The line ranges from savory entrees, soups, sandwiches, sushi, dips, and even dessert. I've had the opportunity to taste from the line last year, and the food definitely had that vibrant flavor that freshly made food often does. 'DeLish' was the appropriate name to pick, I think. I visited the 1350 Broadway Duane Reade to see what was available and was pleased to find many dishes that are similar to what I would have prepared for a big game menu. I picked up the Triple Cheese Mac & Cheese, noodles in a Gruyere, Parmesan, and Swiss cheese sauce, Chicken Fajiita Panini, a very delicious chicken sandwich with a southwestern flair, Homemade Olive Tapenade with Baked Pita Chips, a pureed olive dip, and a mini Raspberry Swirl Cheesecake for dessert. In retrospect, I should have picked up two mac & cheeses and cheesecakes. I nibbled on the food as I dished it (pro tip: remove the plastic cover before microwaving the mac & cheese) and upon my first taste of my selection, my taste buds rejoiced. I added a few carrots to be healthy. It goes well with the tapenade, too. 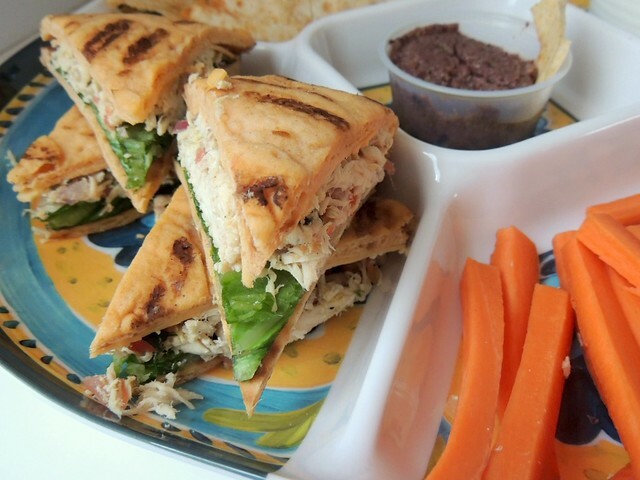 My favorite was the chicken fajita panini. The chicken filling was very, very good, wasn't too moist (nobody likes soggy bread) and had an excellent flavor. Unlike many chicken salad-type sandwiches, the chicken here wasn't coated in a mayonnaise-based dressing. I found that very refreshing. 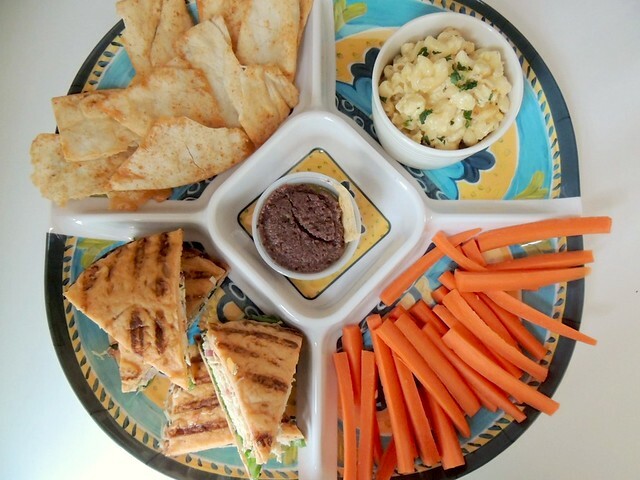 Or, maybe my favorite was the tapenade, since I LOVE olives. It's tough to say. 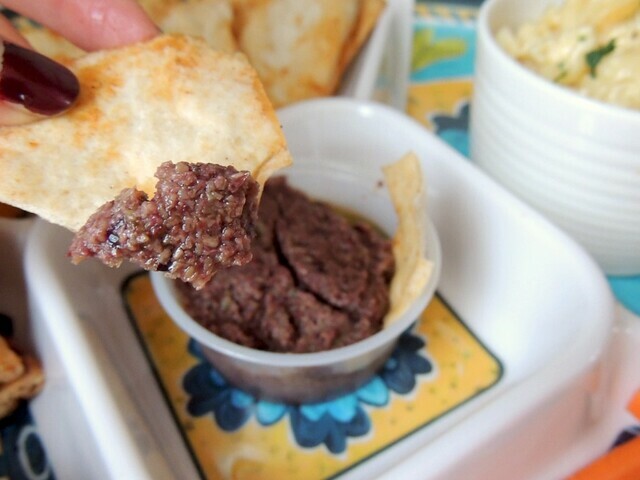 And as a certain famous football player once said, you gotta have tapenade for the big game. 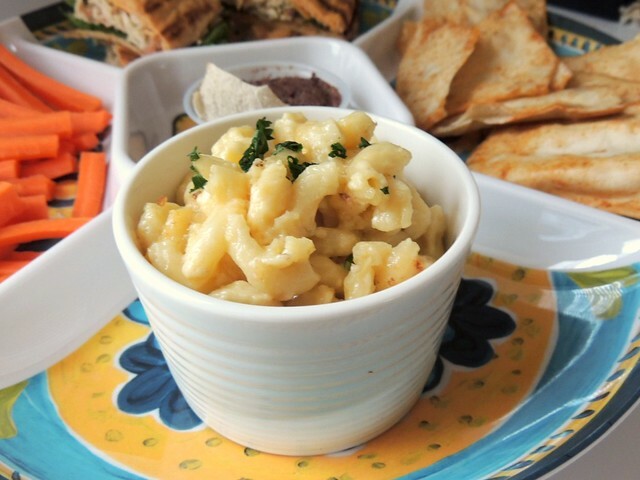 Mac & Cheese is just the perfect comfort food for this time of year, making it a winner. Well, the cheese makes it a winner. This dish features a trio of cheeses and is not your typical cheddar cheese pasta dish. I enjoyed it. 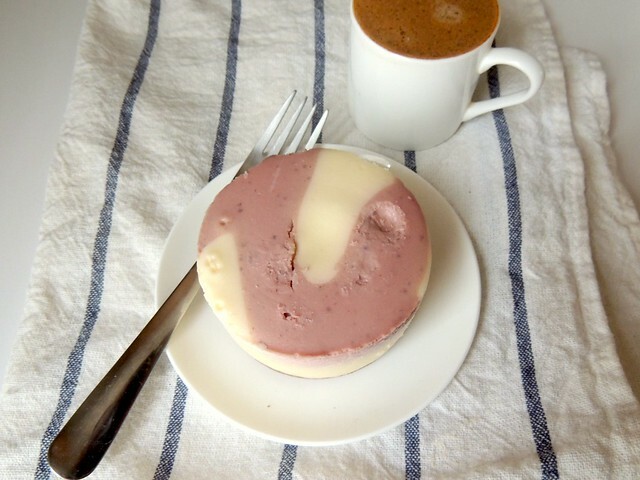 For dessert, I got the aforementioned mini raspberry swirl cheesecake (I promise that's not a fingerprint). There were a few other flavors, too, like a cappuccino, a flavor I would normally choose if the raspberry hadn't spoken to my soul. I should have picked up two of these because they are SO GOOD. I was thinking it would be a nice little treat to split, but that was a very silly idea. 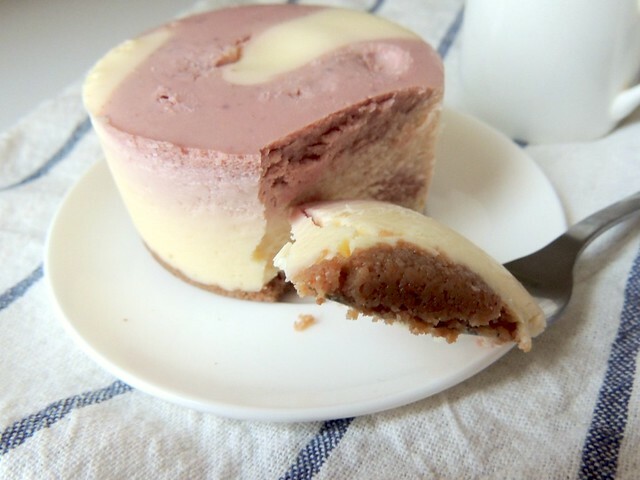 You have to understand that cheesecake isn't my go-to dessert. It's often heavy and dense, as cheesecake is by nature. Maybe I had a change of heart, I don't know, but I thoroughly enjoyed how this tasted and the raspberry was a great flavor. I'm going to have to recreate this. 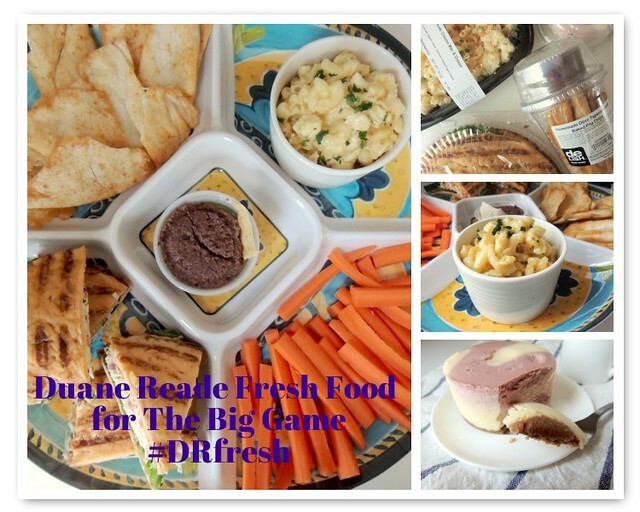 The #DRFresh line works for every occasion, really, not just the big game. For example, lunch. Or when you don't feel like making dinner, or are hanging out with friends. I don't really need a reason, to be honest, I just need to have a craving for tasty food. Check it out if you're in NYC. Did you get hit by even more snow? The weather feels very bipolar this season, with the temperatures ranging from the 50s to the single digits. The only way I know to make sense of it all is to schedule hair appointments and bake cookies. 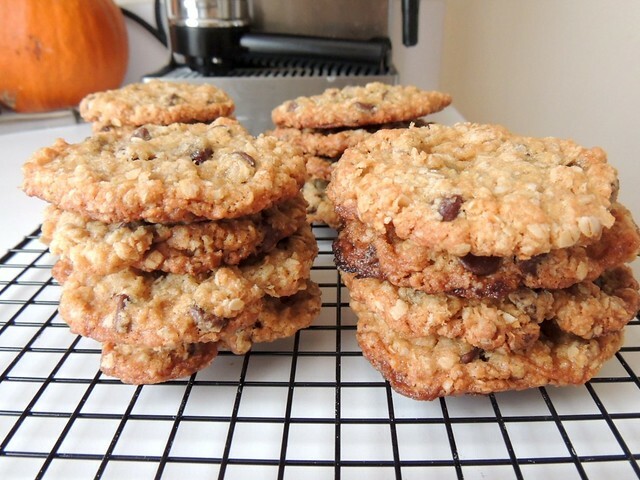 Smitten Kitchen has a delicious oatmeal cookie recipe (from Cook's Illustrated) that isn't spiced and doesn't contain raisins. I switched the white chocolate with dark chocolate to balance the sweetness. Dark chocolate contrasts well with the salted aspect, too. You're supposed to use whole oats -- all I had was quick oats. I don't know if this affected the finished cookie at all, I just know it tastes great. Many people who tried this cookie had an issue with the dough spreading. Mine seemed to spread more than it was supposed to as well, though it wasn't lacy thin. The dough contains a bit of brown sugar, mostly white. Since I didn't have any fancy salt to sprinkle on top, I added a teaspoon of kosher salt to the dough. It tastes fantastic. I got a cold last Friday, and these cookies are the only thing keeping me going (slight exaggeration). The dough tastes incredible, and the cookie is even better. I baked them up crispy, like the recipe says, though there's a bit of chew left in the center. 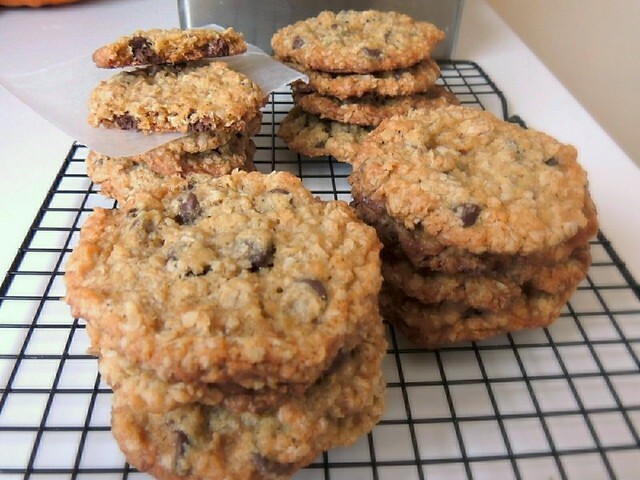 Am I the only one who's somewhat "scared" to try new cookie recipes? 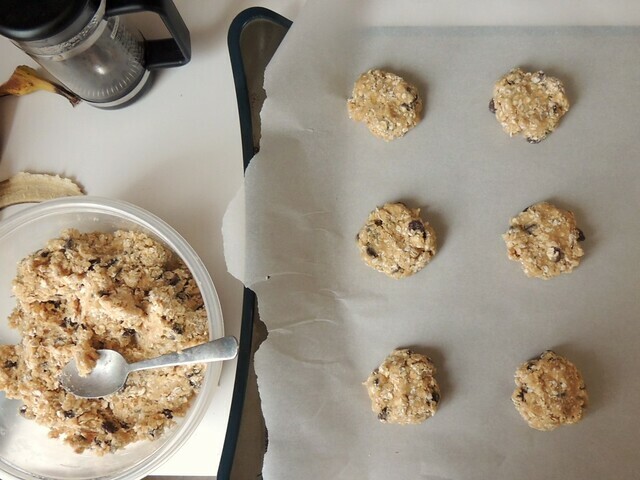 When I want a cookie, I tend to make a recipe I know I like that will satisfy the craving. No, this isn't the most dramatic recipe to take a risk on, it's just that I take my cookie cravings seriously. Orange zest would play well with the flavors, even though the fruit-chocolate combo is cliche. Anyway, there is not much left to say. Try these cookies and you won't be disappointed. I was given these products from BzzAgent on behalf of Kroger. I was not otherwise compensated, and all opinions are my own. Kroger has a new line of natural products, some of which are organic, called Simple Truth. With over 100 new items to choose from, ranging from meat to dairy to cereals, almost all your bases are covered with this line (and if you click on the link, up to $10 worth of coupons are available to load onto your shopper's card). The site lists the 101 artificial ingredients that are not present in Simple Truth products, as well as information on the organic line and meats and poultry. 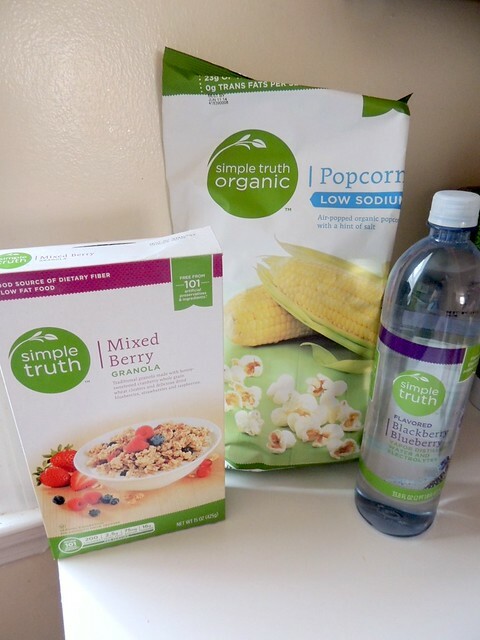 BzzAgent sent me some of the products available in the Simple Truth line to taste and review, and I happily munched away. I tried the Simple Truth Mixed Berry Granola first, because I love granola. 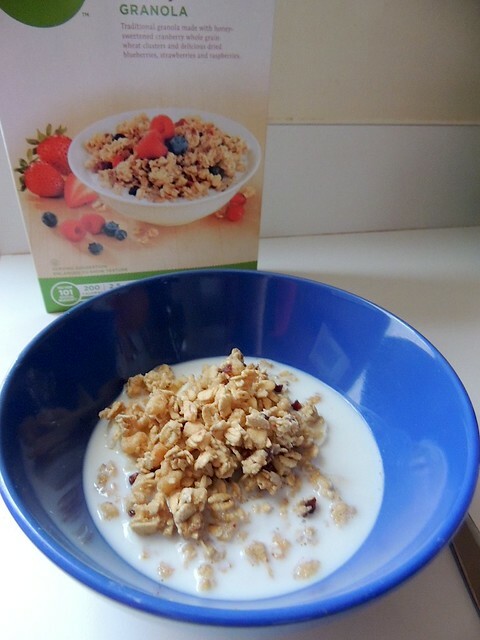 This isn't a traditional granola, though, as it is made of whole grain wheat clusters, not oats. The kernels are crunchy and lightly sweetened. The one con is that there aren't many pieces of dried fruit, and the pieces that are in the cereal aren't very large. It's delicious, otherwise. I judge a granola by its clusters and there were enough of those to give this cereal a passing grade. Containing 200 calories, 4 grams of fiber, 2.5 grams of fat, and 16 grams of sugar per serving, this isn't as dense as oat-based granola tends to be. I tend to keep at least one snack-type food on hand for when I'm peckish, but not hungry enough for a full meal. Or for when I'm ravenous and will grab the first thing I see. 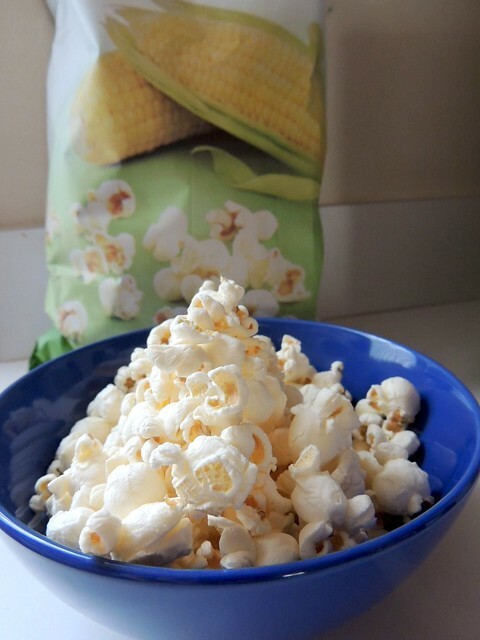 I love popcorn and make it on the stove, so I wasn't sure how I'd feel about the Simple Truth Organic Popcorn, but it ended up being pretty tasty, even for a low-sodium product. The kernels were large and crunchy and didn't taste stale like day old popcorn. It wasn't greasy and I didn't feel like I had just licked a salt lick after finishing a couple handfuls. While it was tasty, it was a bit plain for a snack, and if I got this again I'd try the white cheddar flavor. There is no picture of the Simple Truth Blackberry Blueberry-flavored Electrolyte Water - that would have been a pretty boring picture. This was probably my least favorite product. I liked that it contained electrolytes and would be great for summer training, though to me it tasted like flat sparkling water. I kept expecting something after tasting the initial hint of flavor, but nothing was there to back it up. It's possible that I just don't like flavored, flat water. The flavor wasn't bad, I just wanted more as a drinking water. I wouldn't buy this just to drink, though like I said previously, it would come in handy for exercising in hot weather. Have you tried anything from this line before? Let me know what you think. I have a couple coupons to give away, just email me with your address if you want one and I'll mail it to you. Oatworks gave me samples of their product to review, though I was not compensated in any other way. I was invited to attend the event but was not compensated for it. All opinions are my own. 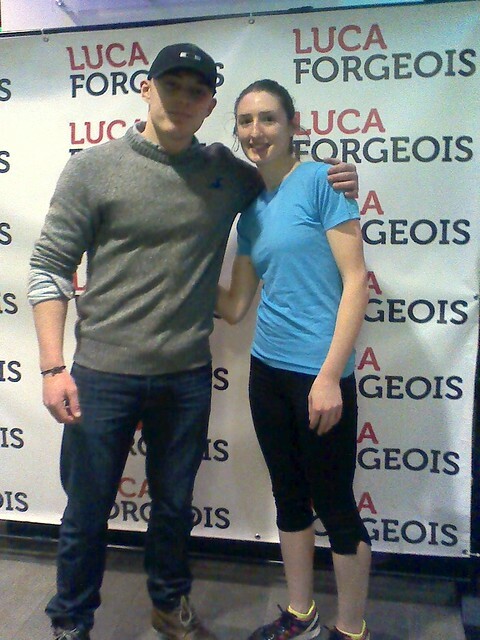 On Wednesday, I had the pleasure of attending Race to Fitness, an event hosted by Oatworks and 24 Hour Fitness featuring 18-year old race car driver Luca Forgeois. Luca has been racing towards his dreams of becoming a professional race car driver after he raced go-karts for the first time at the age of thirteen. He is also an advocate for ADHD awareness and research, having worked to overcome ADHD in his personal life since he was young. Working with CHADD, he was able to get his education back on track when he wasn't able to get the support for his condition through public school. I appreciated that he shared his story with us and talked about how he works to overcome ADHD and not let it stand in the way if his goals. Before attending the event, I read this article from the Wall Street Journal . It gives some insider details on what it takes to become a professional race car driver and I though it was a really good read. Luca's ultimate goal is to be the youngest race car driver to win Le Mans, and I hope he's able to accomplish it. 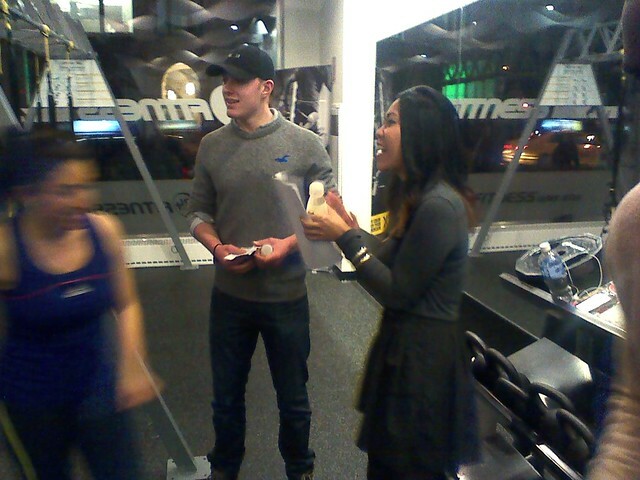 The event was held at the 24 Hour Fitness on Fifth Avenue in NYC. 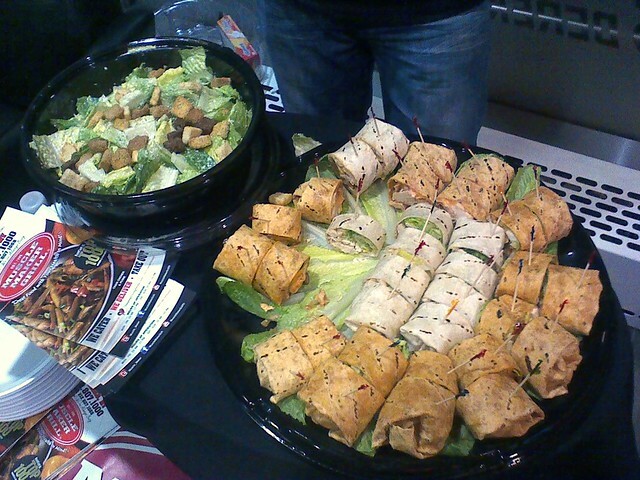 Muscle Maker Grill catered the event, providing delicious wraps and salads. Being new to the city, I'm not familiar with good places to eat when I'm there, and now I have a new place to stop when I want food that is quick and healthy. Shortly after the event started, TRX demonstrations were held. TRX is a 'suspension training' that was born in the Navy SEALS (according to the TRX website) that mostly works by a tool that leverages gravity and your own body weight, allowing you to perform a variety of exercises, developing your core stability, strength, balance, flexibility simultaneously. At first it seems easy, but it's really not (and I'm rather out of shape right now), and my core area still hurts. 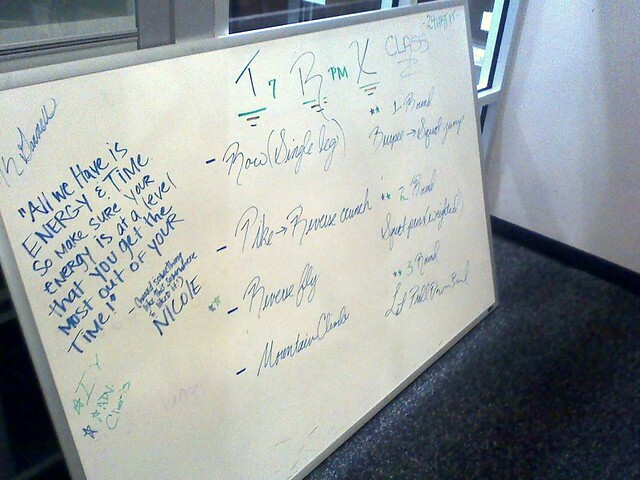 If I had access to the gym, I would pick this up because I enjoyed it. 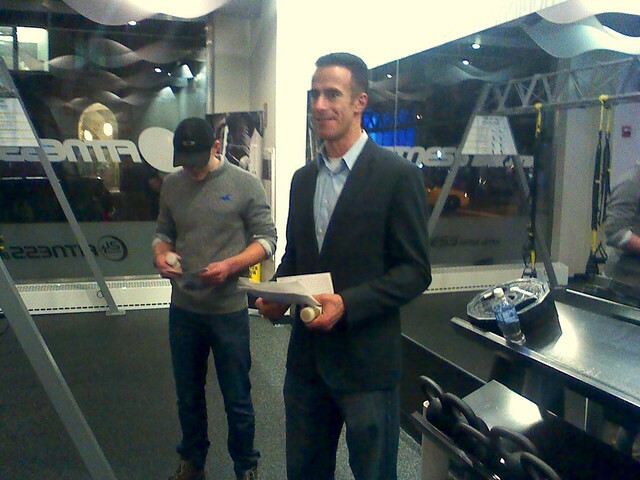 Afterwards, Luca Forgeois and Oatworks CEO, David Peters, spoke. Luca spoke about ADHD and how it affected his education, how he has worked to overcome it, his workouts, and his aspirations as a professional race car driver. David Peters talked about Oatworks and what the drink is all about. 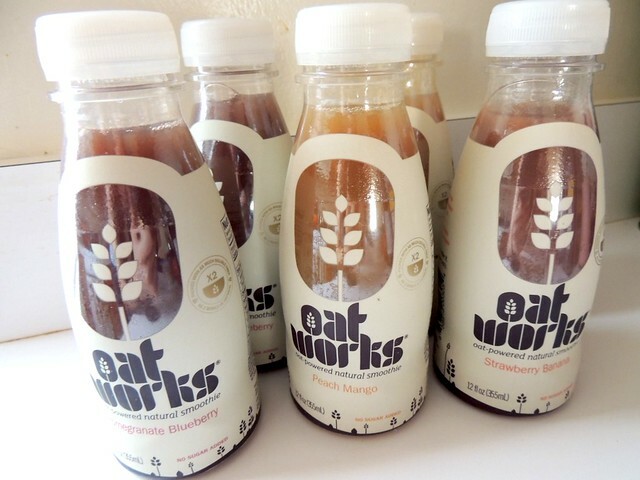 Oatworks is drink containing beta glucan (soluble fiber) from oats combined with fruits to create a delicious, portable smoothie. The soluble fiber forms a vicious gel that entraps nutrients, slows down digestion, and delays absorption of glucose to help prevent sugar highs and the inevitable crashes. On top of all that, soluble fiber may help lower cholesterol. Oatworks smoothies contain no added sugar (other than what occurs naturally in fruit), is vegan, gluten, GMO, and dairy free and is kosher. The smoothies contain 3 mg of fiber (2 of which are soluble fiber) per bottle, which is the fiber equivalent of 2 bowls of oatmeal. Personally, while I really enjoy the consistency and flavor of Oatworks, I've noticed that I sometimes become bloated and insanely full after drinking it (remember, soluble fiber slows down digestion and all that, so it doesn't pass through as quickly as insoluble fiber does). Because of that, I definitely won't be drinking these before a workout, but maybe in between meals or when I miss a meal. So far, Oatworks is only available in NYC (use their locator to find a source), but can be purchased on Amazon. Once the talk was over, Luca demonstrated a few of the exercises that make up his workout. He works with weights and resistance, as shown in the two pictures above. I had the opportunity to participate in one of the demonstrations (an ab exercise, at which I was somewhat decent, fortunately). 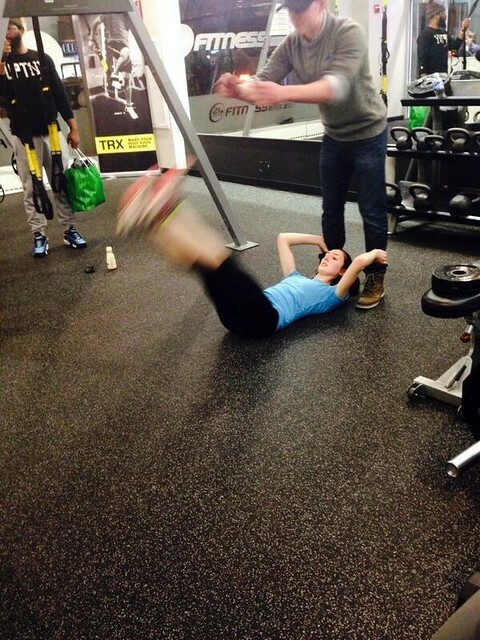 Then, I, along with other participants, "competed" against Luca in a TRX workout. Nobody was keeping count, so we were all declared winners and given gift certificates to Sports Authority! Yay for everyone being winners, right?! 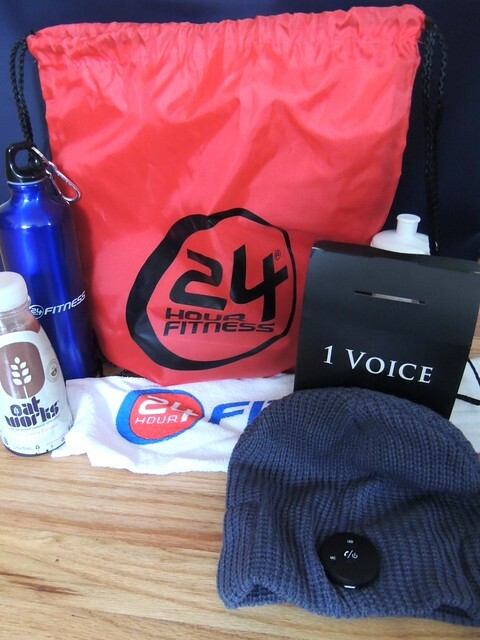 Participants were given goodie bags containing water bottles and towels. I was given a 1Voice wireless speaker beanie to take home. My iPod is too old to work with bluetooth, but I was able to sync it with my laptop and phone (and accidentally called someone in the process...). It's pretty nifty and I'm hooked on the concept of wireless headphones now. Thank you to the sponsors of the event for hosting a great event and giving us the opportunity to meet Luca Forgeois! Lately, I've been perfecting my flour tortilla skills. I started off with an Allrecipes recipe, though I didn't like the ingredient proportions and started changing it up. After many a trial and error, I achieved a recipe with the proportions I liked that made 4 large tortillas (or 6 smaller tortillas, depending on preference). I also learned what the dough should look like, how it should feel, and what doesn't work. Also, I've managed to expedite the process, meaning I can roll out a tortilla as one is cooking in the skillet. 1. 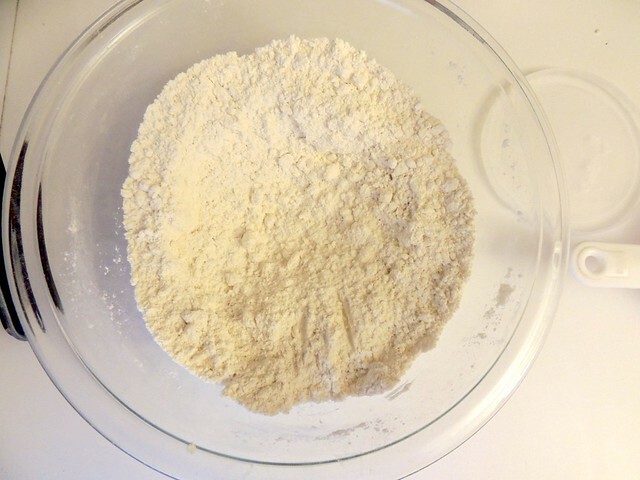 Start by whisking flour with baking powder and salt, then cut in shortening until mixture resembles coarse sand. Unlike pastry dough, you don't really want large, pea size pieces of fat. 2. Stir in hot water. Hot water seems to be the traditional method, though many recipes use warm water. If you're following the recipe in this post, use hot water. 3. 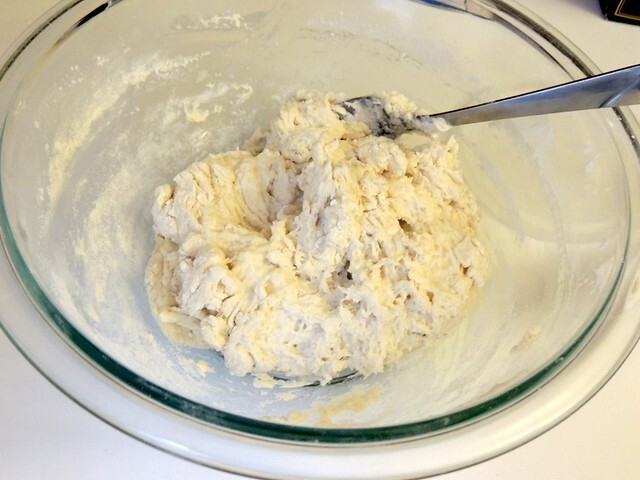 Using a fork, stir until a shaggy ball of dough forms. Many recipes will suggest adding the water little by little, but I like to err on the side of a softer dough, since rolling out a dry dough is difficult. 4. 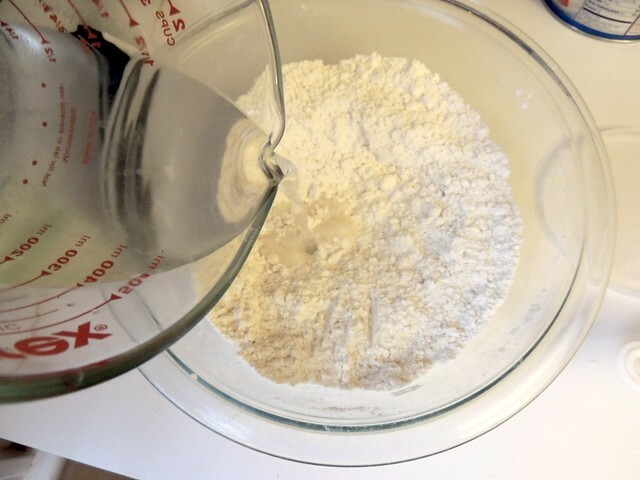 Using your hands, add up to 4 tablespoons flour until a soft dough forms. Gently "knead" for about 1 minute. It should no longer be sticky, but will remain a little tacky. Dust both sides with flour, place in bowl, and cover. Let rest for 20 minutes. Other recipes tell you to knead the dough longer, and I will experiment with this more later on. 5. 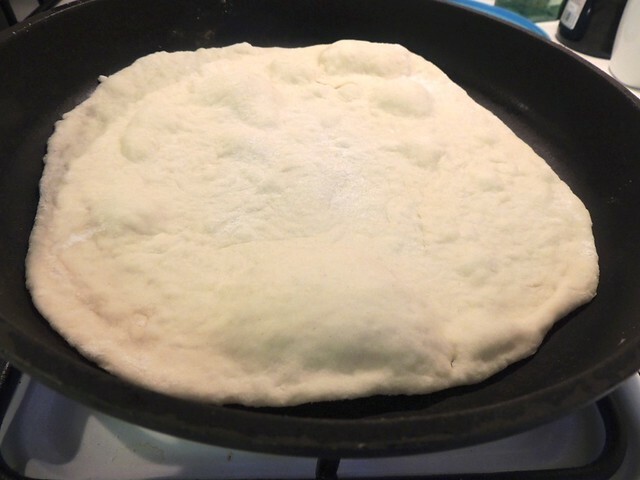 After the dough has rested, place on a floured surface and divide into 4 pieces (or 6 pieces if you want smaller tortillas) for large tortillas. Gently shape into balls using the side of your hand and your fingertips to "pull" the dough from the sides to the bottom, cupping the ball and turning with your hand. This maneuver should also "pinch" the seam on the bottom together. 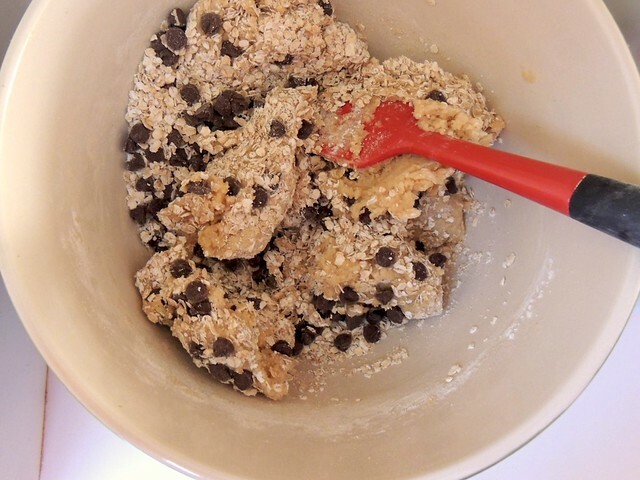 Sprinkle with dough and return to bowl. Cover the pieces that aren't being used. 6. Don't be afraid to use flour. Dust the surface and rolling pin with flour, and keep a small mound off to the side. 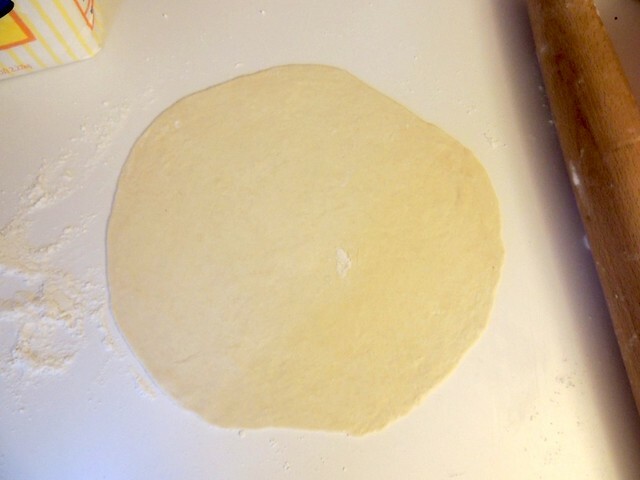 To keep the dough from sticking, I gave it two rolls, one on the top edge and one on the right diagonal. Then I lifted the dough and turned it counterclockwise to the side that I hadn't rolled yet and repeated the process until the desired size was reached, dusting with flour as needed. I learned that (duh) you don't want to roll the dough out to the size of the skillet, otherwise it won't fit, whereas an inch or two smaller than the skillet works perfectly. 6.5. 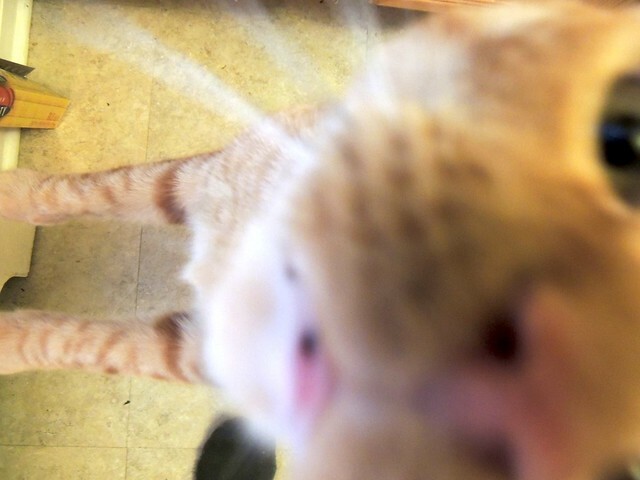 Stop to play with your cat when he decides he finally needs affection when you're busy. 7. Normally, the skillet would be heated over a higher, hotter heat, but that doesn't give you room for error. Preheating the skillet over medium heat (or a tad higher) while rolling out the dough gives it time to heat thoroughly. When you place the dough in the skillet, it should immediately start to bubble. If not, raise the heat a little. Cook for about 15-30 second before flipping. The underside should have golden brown spots. 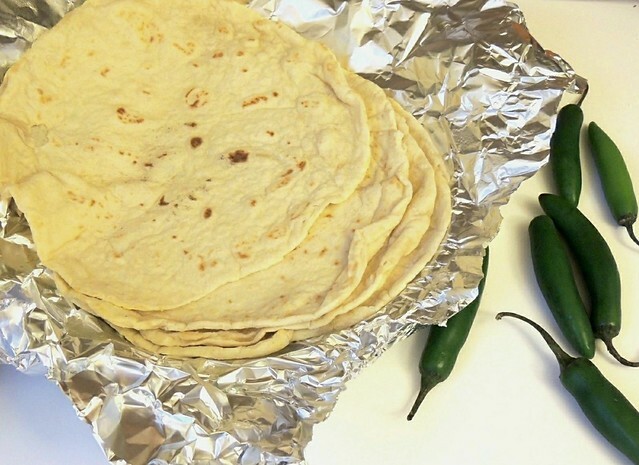 If the heat is too high, the tortilla will brown too much and won't be as pliable after cooling. This side doesn't need to cook for as long as the first side, so keep an eye on it. That's all it takes to make tortillas! I promise you that over time, the process becomes second-nature and quicker the more you make it. The "worst" part for me is having to sweep the floor afterward since the flour always flies off the counter. If you give it a try, let me know how it goes! If you have better tips, share those too. 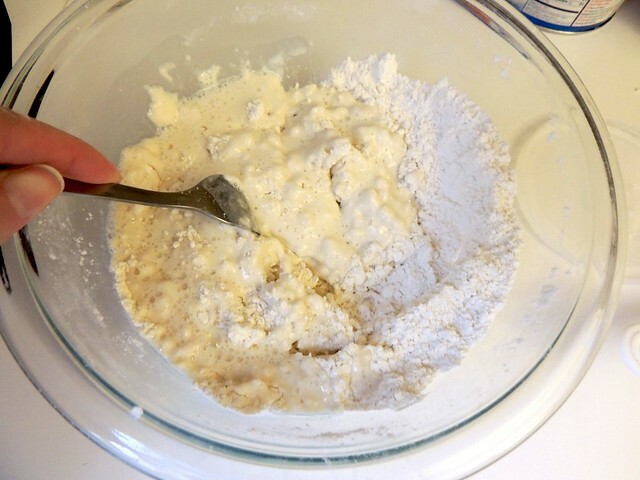 Whisk together 1 1/2 cups flour, salt, and baking powder. Cut in shortening until mixture looks like coarse sand. Stir in hot water until a shaggy ball of dough forms. 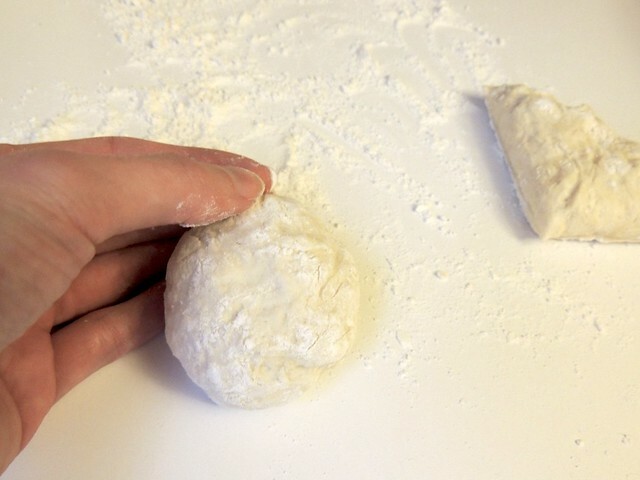 Working with your hands, add up to 4 tablespoons flour to achieve a soft dough that is no longer sticky. Cover and let rest for 20 minutes. 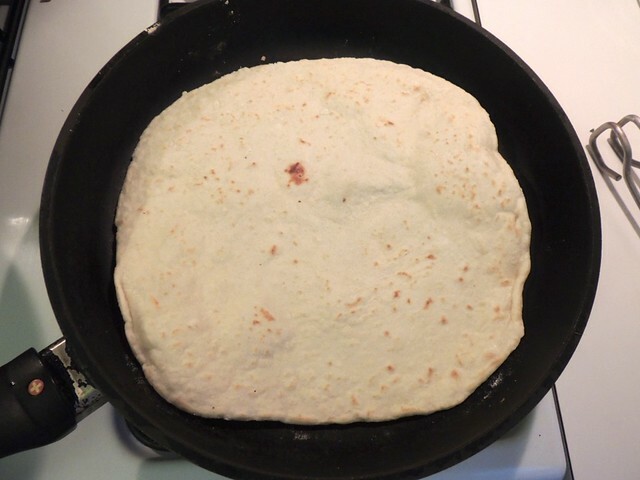 Heat a 10- or 11-inch skillet over medium heat while rolling tortillas. 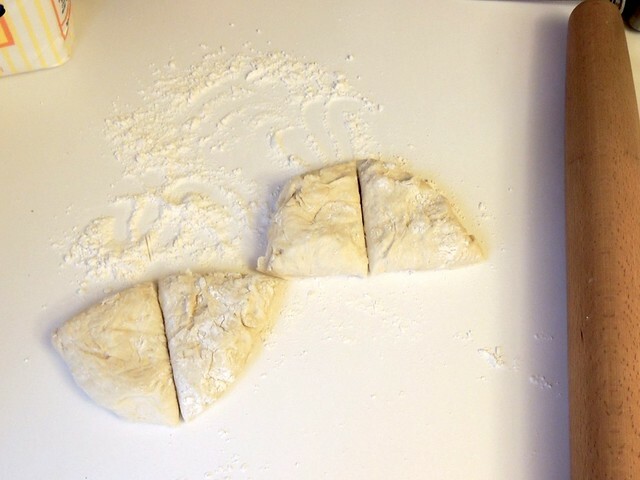 On a floured surface, cut the dough into 4 pieces (or 6 smaller pieces. Shape each piece into a ball and place back in bowl; keep covered. Flouring surface and rolling pin as needed, roll out each piece of dough into a 9- or 10-inch circle, turning dough after two rolls to prevent sticking. Carefully place in heated skillet (you can adjust the tortilla while it's in the skillet by using your finger tips to gently move the tortilla to fit - you won't burn yourself). 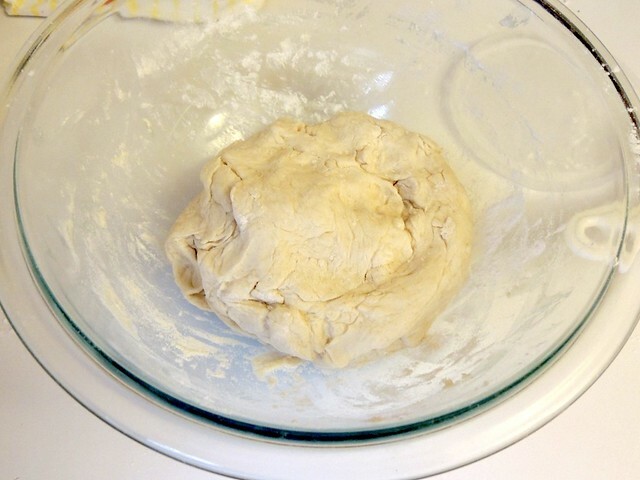 In 15-30 seconds, the dough will bubble and appear dry on top. Using a pair of tongs, carefully flip over and continue cooking for another 15-20 seconds. Both sides should have golden brown spots. 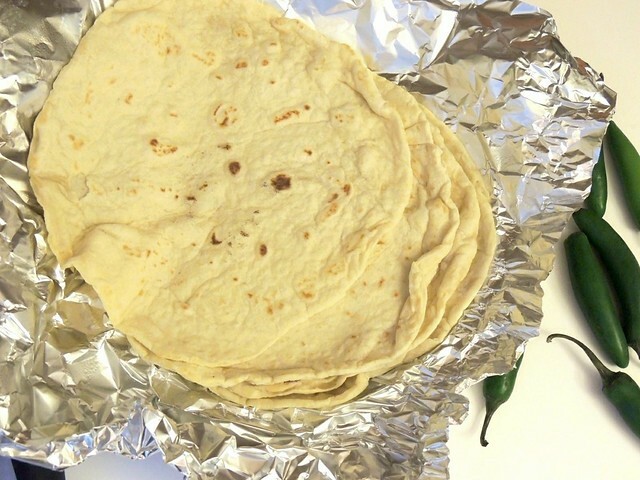 If you cook it too long, the tortilla won't be as pliable after it cools. Remove from skillet to a piece of foil and keep covered until ready to use. Disclosure: I received these products to review last year. I like them and want to share them with you. I was not otherwise compensated for my opinions. Happy New Year, guys! I hope you all had a great time ringing in the new year. I didn't go out, though I cooked up a feast (ribs, pinto beans, jalapeno poppers, homemade tortillas, and guacamole) and watched the Twilight Zone marathon. Although I haven't been running much (I haven't given it up), I have been semi-active. Or a quarter-active. I went hiking the other day, an activity I greatly enjoy. 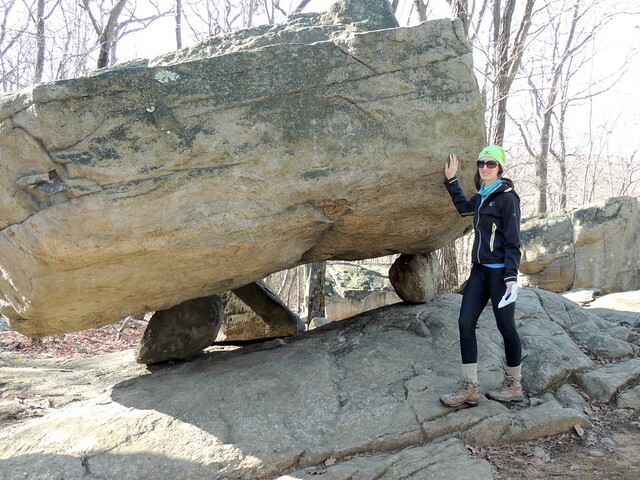 I'm standing next to Tripod Rock on the Pyramid Mountain hike! I hope to increase my hiking this year and go on some longer hikes. A long long time ago, I received these products to review. Mostly out of laziness (for which I apologize to the companies), I didn't put them up, but I kept the pictures because they were products I enjoyed and want to share with everyone. First up is the Hoo Rag Seamless Bandana. What I like about this product is that it can be worn multiple ways, as demonstrated. I like wearing it as a neck gaiter, since my neck is often exposed and it bothers me. 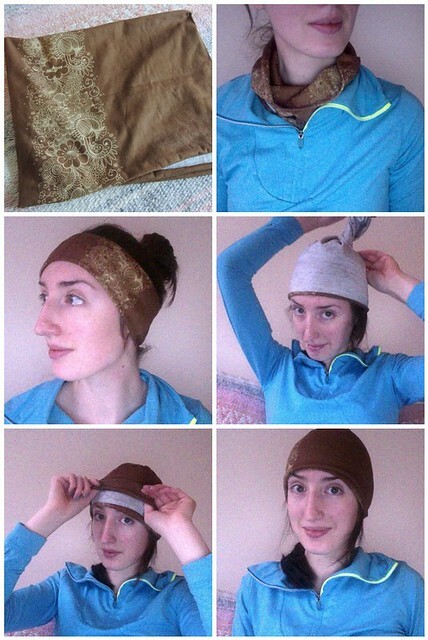 It can also be worn as a headband, or folded to create a beanie in case you misplaced your actual beanie. It's lightweight and not great for super cold or windy weather, but when it's in the 30s or above, or not very windy, it's the perfect weight. In the summer, you can wrap it around your wrist and use it as a sweatband to wipe sweat off your eyes. There are even more ways to style it, as demonstrated in this video. Hoo Rags start at $15. Next up is Pur Pak single serve daily supplements that contain electrolytes. A long time ago during the summer, I would take vitamin C drink packs before a run in warm weather, and I did the same with these. I lose a lot of sweat when I run and drinking extra electrolytes before going out seem to help me not fade as badly. 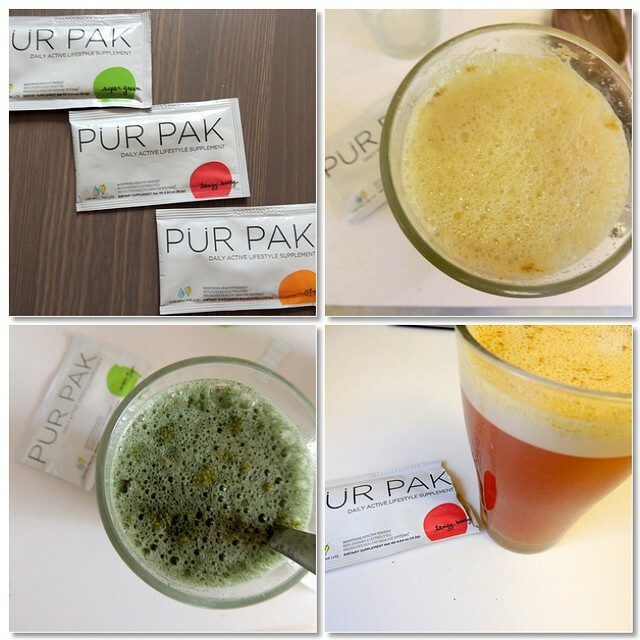 Also, if you hate traditional pill vitamins, Pur Pak is a tasty way to drink your vitamins. Tangy Berry and Super Green were my favorite flavors. 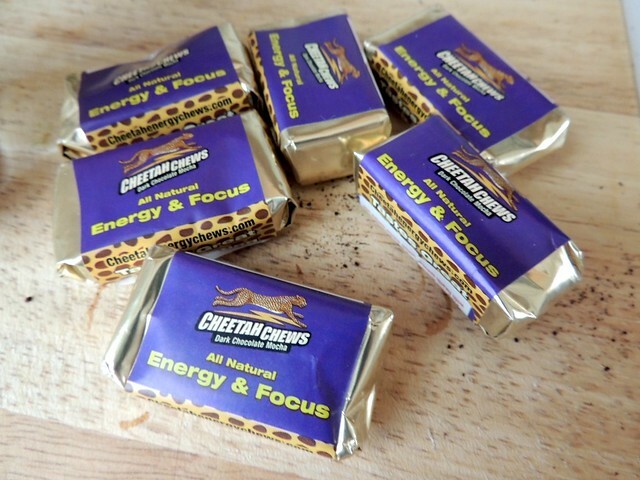 Finally, we have Cheetah Chews, a natural chewy chocolate supplement containing caffeine from green tea and guarana, and B vitamins. 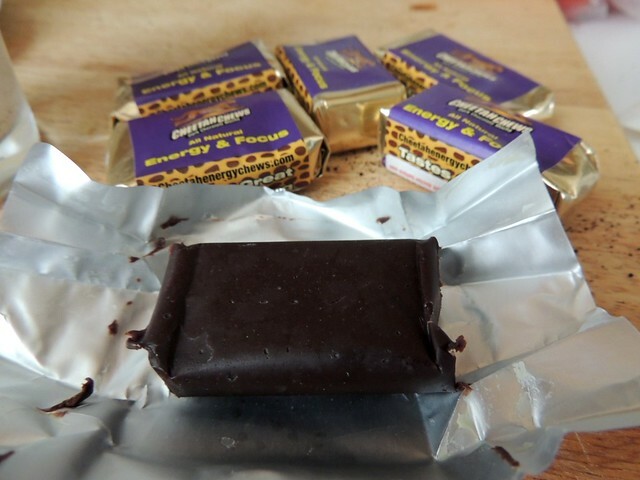 I took these whenever I needed an extra pep in my step and really liked the chewy texture and dark chocolate flavor. And, Cascadian Farm sent me a birthday pack! They sent me a pack a long time ago, too, though I'm not sure I mentioned it. They sent me another t-shirt, which I love. I wear it hiking because it fits well and is so soft. Another water bottle (I use the last one they send me all the time, and the convenience of carrying around a water bottle has helped me drink more water) with a cool Cascadian Farm logo, a tote bag, and a box of peanut butter granola bars. 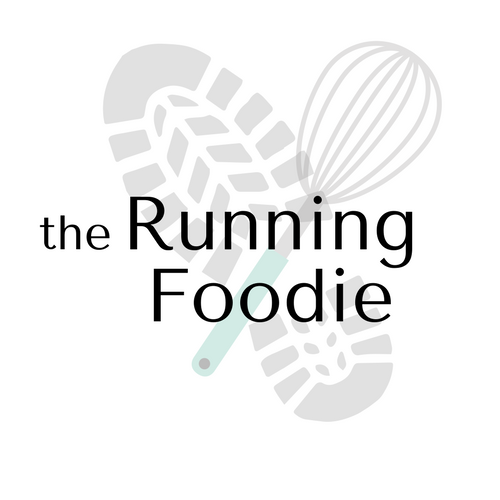 I love their bars and would eat them as a post run snack with hot cocoa. 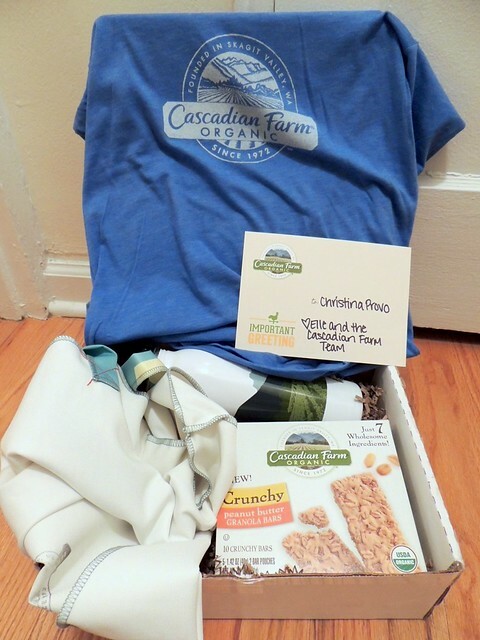 Thank you for the surprise, Cascadian Farms! Let me know what products you like, as I'm always trying new ones. Energy gel recommendations are greatly appreciated as the brand I like (CarbBoom) is going extinct. BOO.